Mindfulness practice has been shown to improve emotion regulation. Practitioners demonstrate the ability to fully sense and experience emotions, but respond to them in more appropriate and adaptive ways. In other words, mindful people are better able to experience yet control their responses to emotions. Exercise is also known to improve mood. It is not known how much exercise or meditation is necessary to produce a mood improvement. In today’s Research News article “Experimental effects of brief, single bouts of walking and meditation on mood profile in young adults.” (See summary below or view the full text of the study at: https://www.ncbi.nlm.nih.gov/pmc/articles/PMC6064756/ ), Edwards and Loprinzi recruited young adults and randomly assigned them to either perform a guided breath following meditation, a brisk walk, or a quiet sit for 10 minutes. Before and after the 10-minute intervention the participants were measured for mood states. They found that after the meditation there was a significant improvement in the participants’ overall mood state and after both the meditation and the walk but not the quiet sit, the participants had a significant reduction in fatigue/inertia. It appears that meditation produced a more global mood enhancement while walking produced an activation that overcame feelings of fatigue. 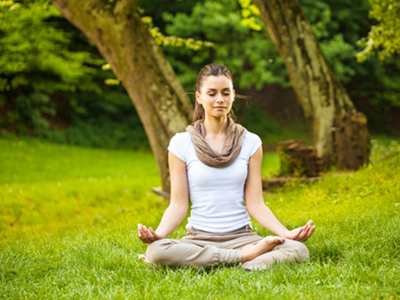 It is surprising that only 10 minutes of guided meditation was sufficient to improve mood. This suggests that meditation has great power to affect emotions. It also suggests that simple brief periods of meditation might be used to assist the individual when there’s a need to control their emotions. So. improve mood with brief meditation. Methods: Participants (N= 66, mean age = 21.3 years) were randomly assigned to walk,meditate, or sit (control) for 10 minutes. Participants’ mood state was monitored before and after the intervention using the Profile of Mood States (POMS) questionnaire. Results: Significant group x time interaction effects were observed for the POMS composite scores (P=0.05). When evaluating three POMS sub scales separately (depression/dejection,anger/hostility, and fatigue/inertia), only fatigue/inertia was found to have a significant group x time effect (P=0.04). Post hoc paired t tests revealed that fatigue/inertia sub scale scores significantly decreased from baseline to post-intervention in both the exercise (P=0.03) and meditation (P<0.001) groups. However, POMS composite scores decreased significantly in the meditation group (P<0.001) but not in the exercise group (P=0.10). Conclusion: A 10-minute bout of brisk walking and meditation both improved mood state,when compared to an inactive control group. A single bout of brisk walking or meditation may offer suitable strategies to improve mood state among young adults.